We take a look, and present an extract from a forthcoming article by one of the nominated authors, neurosurgeon Henry Marsh. 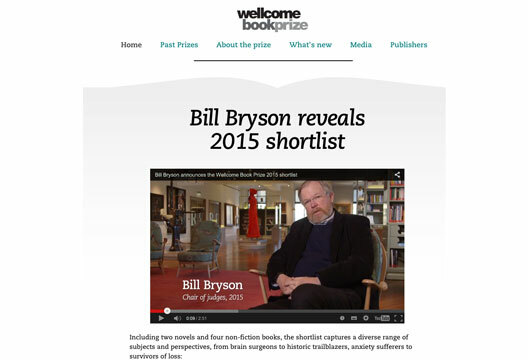 The shortlist for the 2015 Wellcome Book Prize has been announced. Including two novels and four non-fiction books, the shortlist 'captures a diverse range of subjects and perspectives, from brain surgeons to historic trailblazers, anxiety sufferers to survivors of loss'. All, according to Chair of Judges Bill Bryson, 'examine the human relationship with health and how it affects us all: for good, and sometimes for ill'. The Iceberg: a Memoir (Atlantic) is by Marion Coutts, a young artist whose husband developed a brain tumour and eventually died. 'You feel almost as if you are reliving this experience with her in real time', Bryson commented. Professor Frith said 'it deals with death and grief, in a wonderfully poetic way'. Alice Roberts' shortlisted book The Incredible Unlikeliness of Being: Evolution and the Making of Us (Heron) is described by Bryson as one which gives 'a lot of information about things that we really ought to know about, but it does it in a way which is thoroughly absorbing and engaging.' It has a chapter on head and brain. Professor Frith describes 'My Age of Anxiety' by Scott Stossel (Windmill Books) as a 'totally honest look by the author at his own crippling fears and attempts to overcome them. The book can be recommended to psychologists as being almost comprehensive in its coverage of research in possible treatments and for its informative footnotes.' Bryson calls it 'at times unexpectedly hilarious, but mostly just moving and touching'. 'All my Puny Sorrows' by Miriam Toews (Faber) is described as 'a startling demonstration of how to carry on with hope and love and the business of living even when grief loads the heart.' Professor Frith notes that 'it deals with suicide and the helplessness of the bystanders'. Last but by no means least is Do No Harm: Stories of Life, Death, and Brain Surgery by Henry Marsh (Weidenfeld & Nicolson). Marsh is a Consultant Neurosurgeon with over four decades of experience, and his book has been described as 'painfully honest' by fellow author Ian McEwan. 'It talks a lot about the joys and triumphs of success,' Bryson comments, 'but it is also unstinting in talking about failures and the limitations of what doctors can sometimes do.' Marsh has written an article for The Psychologist on his understanding of brain and behaviour, and the role of psychology in his work. It is due for publication in June, but we present an extract from it here. The winner of the 2015 prize will be announced on 29 April 2015.